In a fresh Firefox profile, install Adblock Plus 2.6.1. Install Element Hiding Helper for Adblock Plus 1.3. Install Greasemonkey 1.15 and restart Firefox when prompted. Visit any user script page and click the Install button, e.g. The script opens inside the browser tab, and there's a notification bar with an Install button at the top of the window. The browser shouldn't navigate away from the current page (the script shouldn't open in the tab as plain text), and a dialog window titled Greasemonkey Installation should pop up. Choosing "Disable Everywhere" in Adblock Plus doesn't help. 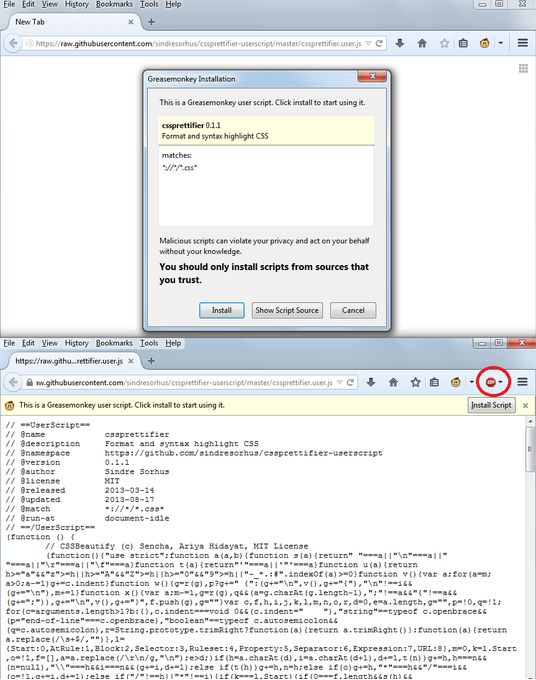 Both Adblock Plus and Element Hiding Helper must be disabled. Either one enabled by itself triggers the problem. ​See the screenshot on GitHub. ​See the Bug Reports forum thread. I can no longer reproduce this, therefore marking as WORKSFORME.